Increased understanding of the nutritional values of lipids, has led to the development of novel technologies for modifying fats and oils, or enrichment and isolation of bioactive lipophilic compounds to enhance health benefits resulting from ingestion of these substances. In the last decade, supercritical fluids have proved their ability as an environmentally benign media for extraction, chemical and enzymatic reactions and related processes. Many new processes and products have been developed, using the inherent physical and chemical properties of supercritical fluids. 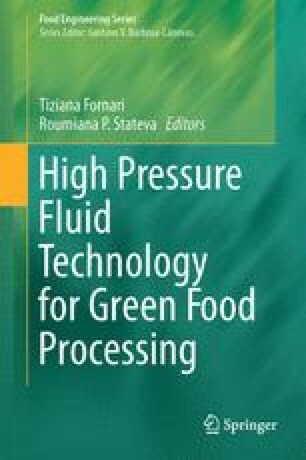 In this chapter supercritical fluid extraction (SFE) of fat and lipid compounds is reviewed. The effect of pre-treatment and additional conditioning processes on SFE processing is discussed. Finally, supercritical CO2 biocatalytic strategies focusing on the production of bioactive lipids for food industry are presented.